Wouldn’t it be great to be able to see which of your Twitter followers are around right now so you know who’s likely to read your next tweet? Twitter analytics startup SocialBro has just rolled out an update that lets you do just that. SocialBro is a free app available for Google Chrome and Adobe Air that allows you to get a broad overview of your Twitter community. We’ve written about it a number of times in the past (most recently when it integrated PeerIndex scores) and it’s truly a useful tool. With the new real-time feature, you can see which of your followers are active, the number of active users per second, the languages your followers are tweeting in and the apps and clients that they’re tweeting from. It’s not just your followers either, you can monitor a particular Twitter list or a search term – meaning that you could see a bit more about the people tweeting about a certain topic right now. So, how does it work? SocialBro counts ‘active’ as someone who has tweeted in the past 5 minutes, although future versions will be configurable for a wider range of criteria. 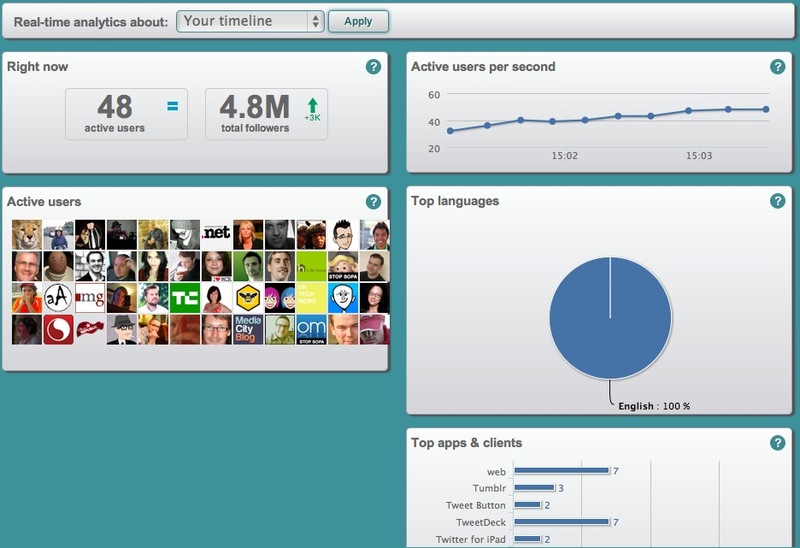 To see at a glance the real-time state of your community and to identify users who are online, to interact with them. If you have a multi-language account, the language chart helps you identify the best language to tweet in at any given time. If the users are mostly tweeting from apps like Foursquare or Instagram, for example, they probably are not aware of their timelines in that moment. You can monitor a specific group of users via a Twitter list. You also can monitor a hashtag or a key word to get an idea of how active they are. The real-time analytics feature is currently limited to a maximum of 100 concurrent users, meaning that if you’re monitoring a busy topic or a lot of your followers are active, you might not see them all. It should give you a good flavour of what they’re up to though. The video below gives you an idea of how it works, or you can dive right in to give it a try.